“Beauty is what health and happiness look like on the outside”. This may be an old quote but is just as true today as when it was written. (Good Housekeeping 1916) So for my spring into beauty tips, here are some simple choices that can help you look your best! Start every day with sun protection. The best and scientifically proven way to keep your skin looking its best thought your life is using good sun protection and religiously applying it daily. Even when the sky is cloudy, UV rays can penetrate to affect your skin. Changes that occur include dehydration, loss of elasticity and breakdown of collagen. When you are younger, the changes are less noticeable, but trust me when I tell you that you will pay the price later in life with the aging changes, not to mention the increased risks of skin cancer. Use the right skin care. There are many creams and lotions on the market, and when you look at the shelf, you wonder what is best. I suggest starting with a skin care analysis from a health professional. Aestheticians and Cosmetologists, particularly when they work as a team with Plastic Surgeons or Dermatologists, know best how to customize treatments to your skin type and needs. In addition, over-the-counter products may be sufficient to keep your skin moist and protected, but they lack the ability to truly “turn the clock back”. For most individuals with normal type skin, I recommend three main ingredients. One, serums that contain antioxidants like Vitamin C will help to brighten your skin. Two, to help increase cell turnover and stimulate collagen renewal, a product for nighttime should include retinoid (vitamin A), and three, use an alpha hydroxyl acid product either in solution form or cream to help remove the top dead layer of skin cells. Want radiant skin that glows? Ever hear the expression we are what we eat? Well guess what? Take it literally. Go for items that are nutrient dense, like fruits, vegetables, whole grains, nuts and healthy lean protein like fish. If you struggle taking in plenty of vegetables, consider taking vitamin supplements. Vitamin D deficiency is rather common, particularly following a long winter, and supplements can help to boost your levels. If you prefer meat to fish, take Omega 3 fish oil to keep your skin glowing. It works by reducing inflammation and can even help with skin problems like acne and psoriasis. Not only will eating well improve the way you look on the outside, but these same choices help on the inside, and are beneficial for aging changes like menopause and heart health. De-stress. – You will show all those worry and stress signs on the surface of the skin. 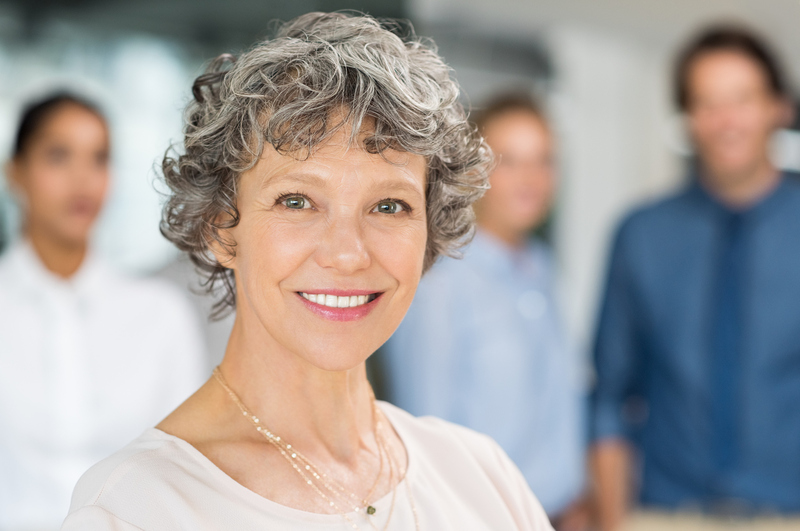 Frowns, lines and wrinkles are accentuated when you don’t take the time to reduce anxieties. Do things you enjoy, like reading, meditation, hobbies, or other activities particularly outdoors, like walking or playing golf. The fresh air and fitness will help keep you mentally and physically fit and improve your outlook. Enjoy life! – I recently saw the Carol King Musical-Beautiful. To paraphrase her lyrics for that popular song, “You have to get up every morning with a smile on your face…people gonna treat you better, You’re gonna find yes you will”. I find that people are most beautiful when they smile. Have the right attitude towards life and surround yourself with people you like. If you find beauty in the world, beauty will find you! Follow these simple tips to Spring into Beauty. Does the healthy, moist appearance of summer skin disappear in the ‘off season’? Here are my tips for keeping your skin it’s best when the cold wind blows. And don’t forget the Sunscreen! 1- Avoid Hot Water– Many believe that taking a hot shower can increase the circulation and make the skin healthier. The problem is that the hot water removes the important oils on the surface, which are essential to keep your skin healthy. This protective layer is especially important for those with sensitive skin. Hot water can lead to skin irritations and rashes as well. Keep it tepid. 2- Don’t overdo the prescription skin products- I have been managing skin problems and anti-aging management since I began in practice since 1989. I am not a big proponent of prescription-strength retinoic acid, and I have never written a prescription for that with my patients. 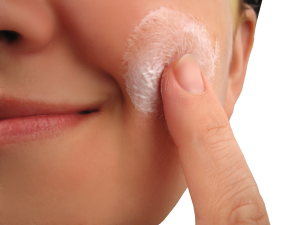 The lower strength products containing retinol provide a more mild mixture, which will cause less irritation. Patients always think more is better, but irritation is our enemy when it comes to the skin. Be patient in your rejuvenating home treatments to slowly turn the clock back. 3- Mind your fruits and vegetables- just like grandma always told us, “Eat those fruits and vegetables”! They help to promote good digestion and are powerful antioxidants to reduce inflammation and irritation of the skin. This can help with those that suffer with acne breakouts as well. Use of Probiotics can help keep your skin clear and adding Vitamin D supplements will help maintain Vitamin D levels throughout the winter months when exposure to UV light is limited. 4- Lymphatic massage- when you wash your skin, take 30 seconds to stimulate lymphatic drainage. Gentle massage in a downward direction can decongest the skin by stimulating the lymphatics. By promoting lymphatic drainage, one can reduce redness and inflammation thus calming the skin. 5- Scrub the Scrubs!– When I see irritated skin on my patients, my first question is, “how often do you exfoliate with scrubs?” I can tell right away that something is causing irritation. I usually recommend using these scrubs no more than once or twice a month. Rather than using these home scrubs, which push the debris into the skin and create irritation, consider mechanical exfoliation with microdermabrasion at the doctor’s office. This will lift off the dead skin cells and debris, leaving you with healthy skin receptive to the skin products you apply. 6- Sun Protection-So you think that just because it is winter, the sun won’t create damage? Think again. The earth is actually closest to the sun during the winter months. Add to that, the fact that the snow and ice act to magnify the intensity by reflecting the sun adds to the insult. They reflect about 80% of the UV rays. To top it off, the ozone layer is at it’s thinnest during the summer months, causing more need for concern. Sunblock should be the rule all year, and equally important in the winter! 7-Hydrate-Hydrate-Hydrate!– Did I say HYDRATE?- The dehydrated outside air and forced hot air inside wreak havoc on the skin by drawing out the moisture. Skin not only can become dry and cracked, it can become more aged looking with the appearance of lines and wrinkles. Drinking plenty of water can help, and consider using cream cleanser instead of gels. Omega 3 fatty acids in the diet are great year round, but especially during the winter months to help with hydration and reduce inflammation. Using a super moisturizer is a must to hold in the moisture, and should be applied twice daily, immediately after cleansing. Hyaluronic Acid ingredients are utilized in skin products to hold in moisture by way of their hydrophilic water absorbing properties. 8-Professional Skin Care-Lastly, don’t let your skin get too far-gone. Have a professional hydrating facial every 4 – 6 weeks during the winter months. An experienced esthetician will start off with a skin peel to help exfoliate the build up of dead skin layers from the summer, and then incorporate high-energy iontophoresis and sonophoresis to allow maximum absorption of the products. Enjoy the winter wonderland in Western New York, but don’t forget to protect your skin! Until Next time….Be Well Buffalo! During this time of the year during the winter holidays, if you find that the joys of the season have lead to the overweight depression, you are not alone. Data from the National Institute of Health suggests that most Americans who gain weight during the holidays never lose those extra pounds and the weight keeps adding up throughout their lives. Maybe this year, ‘New Year, New You’ will prevail! Individuals go in droves to sign up for fitness memberships even more than they flock to Plastic Surgeons offices to get themselves trimmed up for the spring. But if all the ‘trimmings’ of the winter excess have caused you to put on some pounds, take a look at how that happened, and correct it. That is right, hitting the gym or the operating room is nowhere to start. You may find it hard to believe, but weight is lost in the kitchen and health is gained in the gym. Both are important, but to really lose the pounds you need to lose the bad dietary habits. Let’s look at this more closely. In order to lose a pound of weight, one must burn 3500 calories more than they ingest. Here’s an example; take a 200-pound male. If he is moderately active, he might consume about 3200 calories a day to maintain his weight. If he wanted to lose a healthy 1-pound per week with exercise only, keeping his eating the same, he would have to burn 500 calories more per day. That would require him to jog about 3.5 to 4 miles per day, depending on his speed, every day for 7 days per week. That amount would total the 3500 calories needed to lose that pound. On the other hand, cutting 500 calories from his diet (the equivalent of two Starbucks Frappuccinos, or three soda drinks per day), would achieve the same result. Most of us would have an easier time with cutting the calories by altering caloric intake. 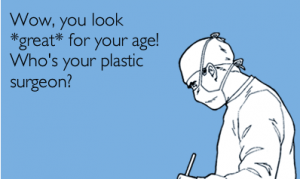 So you may ask, why does a Plastic Surgeon concern himself with weight loss? It is nearly a daily occurrence that I see patients coming in for consultation for either liposuction or Tummy Tuck surgery desiring to improve their waistline to fit better into their clothes. Liposuction is a procedure to remove localized areas of fatty deposits, like love handles, tummy pooch or outer thigh areas. If one is heavy all around, and there is no distinct location of the fat, then weight loss is usually required to achieve the ideal result. 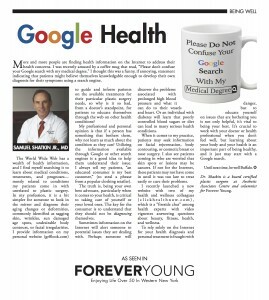 I start out the conversation with something like, “I want this consultation to be focused on encouraging you to achieve the results you want, which will happen with a combination of your weight reduction and my surgical techniques” (or something to that effect). When I first started in practice in 1989, I recall the occasions of patients coming back to me one to two years after liposuction surgery saying, “you didn’t take enough off”. After showing the patient their 6 months post op photos and demonstrating the nice contours achieved, the patients then realized they had gained the weight back, sometimes due to the fact that their clothes fit better and the stop mechanism of a tight fitting belt was less of a problem after the surgery. Currently, by working with patients and helping them make better dietary choices, they not only lose weight before the surgery, but they have adopted good eating habits to keep the weight off, and more importantly, become healthier. 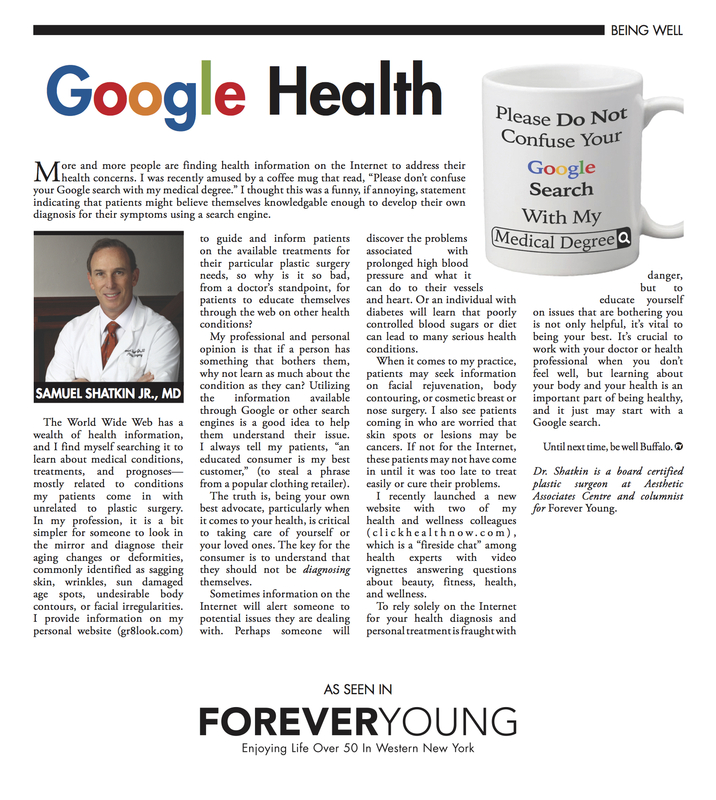 Our job as physicians and health professionals is not only to make them look better, but be healthier too. 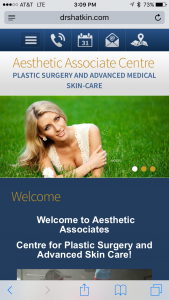 For the past 9 years, the Aesthetic Associates Centre has been running regular nutrition and weight loss classes to help individuals achieve better health through nutrition. The average patient loses 25 pounds in the 12-week program. Many will consider plastic surgery to finish off the contouring, but some often achieve their goals without surgery, and although we may have lost a patient to weight loss, we have gained a client with a healthier future. So don’t let the joys of the holidays control our waistline. Let’s take control of our health. Eat healthy and be healthy! and the art of plastic surgery. The goal should be to turn the clock back. Patient will often bring in photos of themselves as a younger age to share with me what they are hoping to achieve. Occasionally, an elderly patient will bring in a portrait ofhimself or herself from when they were 20, hoping to regain that look. 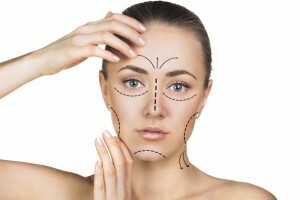 If the surgeon attempts to gain that look, it is almost certain the patient will have an over pulled, flattened facelift, not the natural lifting and redrapping which is desirable. When I attend our national meetings, and see lectures from many of the top plastic surgeons in the industry, we see results with a natural rejuvenation. That to me is the mark of a surgeon looking to rejuvenate, not totally change the look of someone’s appearance. The skills of a board certified Plastic Surgeon give one the tools to create the natural look, but it is up to the surgeons themselves to execute a more youthful result without creating a distorted change. 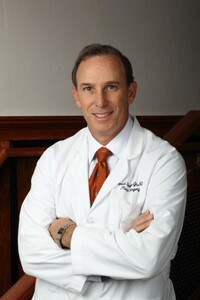 When I first started in practice, I had the unique opportunity to work with my father, both a skilled surgeon and mentor, who had that aesthetic eye to create harmony and beauty in natural way. Learning first hand from such an expert has given me an ideaperspective on recreating a youthful appearance to help the patient achieve the look they desire. Some patients may be hoping for that “Hollywood look”, but I would much prefer a complement, “wow, you look great”. Do you have sensitive skin? More than 1/2 of women in the USA suffer from “sensitive” or “very sensitive” skin conditions according to survey of the International Society of Dermatology. Does the healthy, moist appearance of summer skin disappear in the ‘off season’? Here are 5 tips I recommend for keeping your skin looking it’s best when the cold wind blows. 1- Avoid Hot Water- Many believe that taking a hot shower can increase the circulation and make the skin more healthy. The problem is that the hot water removes the important oils on the surface which are essential to keep your skin healthy. This protective layer is especially important for those with sensitive skin. Hot water can lead to skin irritations and rashes as well. Keep it tepid. 2- Don’t overdo the prescription skin products- I have been managing skin problems and anti-aging management since I began in practice since 1989. I am not a big proponent of prescription-strength retinoic acid, and I have never written a prescription for that with my patients. The lower strength products containing retinol provide a more mild mixture which will cause less irritation. Patients always think more is better, but irritation is our enemy when it comes to the skin. Be patient in your rejuvenating home treatments to slowly turn the clock back. 3- Mind your fruits and vegetables- Just like grandma always told us, “eat those fruits and vegetables”! They help to promote good digestion and are powerful antioxidants to reduce inflammation and irritation of the skin. This can help with those that suffer with acne breakouts as well. 5- Scrub the Scrubs!- When I see irritated skin on my patients, my first question is, “how often do you exfoliate with scrubs?” I can tell right away when I look at their skin that something is causing irritation. I usually recommend using these scrubs no more than once or twice a month. Rather than using these home scrubs, which push the debris into the skin and create irritation, consider mechanical exfoliation with microdermabrasion at the doctors office. This will lift off the dead skin cells and debris, leaving you with healthy skin receptive to the skin products you apply.